Meniscus tear treatment aims to reduce the pain and inflammation associated with a knee cartilage tear as well as restore strength, flexibility and function. A torn meniscus is one of the most common causes of knee pain. The meniscus is a special thick layer of cartilage that lines the knee joint providing cushioning and support. When the meniscus get torn, either through a twisting injury or gradual wear and tear, it can lead to weakness, stiffness, locking and pain in the knee. Most commonly, there is a medial meniscus tear, on the inner side of the knee. It can take quite a while to recover from a meniscus injury as the cartilage has a poor blood supply which slows healing so effective treatment is vital. 1) Non-Surgical Treatment: In the early stages, meniscus tear treatment aims to reduce the pain and inflammation through the use of ice, medication and occasionally knee braces. For the long term, the best meniscus tear treatment is exercises to strengthen the knee and regain full movement. 2) Surgical Treatment: where part of the meniscus is trimmed or removed via keyhole surgery. 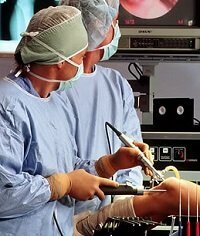 This is usually done if pain continues despite trying non-surgical treatment, or there are problems with locking, where the knee gets stuck in one position due to a flap of cartilage blocking the joint, surgery may be required. Whether you are going down the surgical or non-surgical meniscus tear treatment route, exercises are really important and here you will find a whole range of exercises that should help. 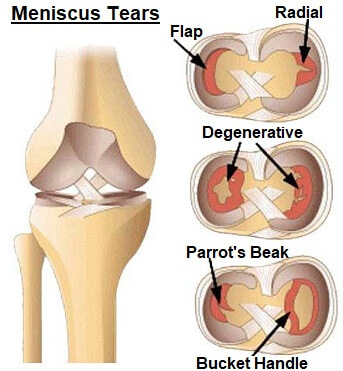 To find out more about other meniscus tear treatment options including knee braces and surgery, as well as the different types of tear, the common causes and symptoms, visit the meniscus tear overview. Exercises are one of the best meniscus tear treatment options both short term and long term, whether or not you have surgery. They aim to increase the strength of the muscles around the knee so that the amount of weight going through the cartilage is reduced, allowing it to heal. Here we will look of a range of meniscus tear treatment exercises that can help. You don’t have to do all of them, pick two or three from each category that feel best for you, and stick with those. When you have a meniscus injury, or after meniscus surgery there tends to be swelling in the knee joint which stops it being able to fully bend and straighten. It is much harder work for the body to function with a knee that doesn’t have full range and the torn meniscus ends up taking more weight through it, which can slow down the healing process and make it more prone to damage. Regaining full range of movement at the knee is therefore a vital part of meniscus tear treatment. The stronger the knee muscles are, the less weight goes through the knee joint and therefore the torn meniscus. Muscles lose strength after just a few days of rest so it is vital to build up strength as soon as possible. Having good strength in the muscles also ensures that the weight which does go through the torn meniscus is distributed evenly, again speeding recovery. Strengthening exercises are therefore another vital part of meniscus tear treatment. Purpose: Strengthen the buttock muscles (glutes) to help support the knee and prevent excessive weight going through the inner side of the knee, a majority of tears are medial meniscus tears. Progression: Once you can do 25 of these easily, progress onto single leg bridging – see Intermediate exercises. The exercises here are specifically tailored towards meniscus tear treatment. Once these meniscus tear treatment exercises feel easy, you can progress on to more general intermediate and advanced strengthening exercises to help you recover fully from a torn meniscus. Sometimes after a meniscus injury, the kneecap muscles get weak. This leads to patellar maltracking, a problem with how the kneecap moves, and can lead to longer term knee problems. To find out how to strengthen your kneecap muscles, visit the kneecap strengthening section. If you have problems with persitent locking at the knee (i.e. it gets stuck in one position), or your symptoms fail to settle, you may well need surgical meniscus tear treatment, usually an arthroscopy. 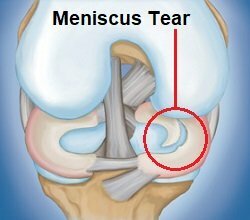 You can find out more about this in the Meniscus Tear section.